Heat oven to 350°F. In large bowl, mix flour, 2 tablespoons sugar, the salt and lemon peel. With pastry blender or fork, cut in butter and shortening until mixture resembles coarse crumbs. Stir in egg yolks and 1/2 cup of the milk. With fork, stir until mixture leaves sides of bowl and forms a ball, adding milk 1 tablespoon at a time as necessary. Form dough into 2 balls. On lightly floured surface, roll out 1 dough ball to 17x12-inch rectangle. Carefully place in ungreased 15x10x1-inch pan; press in pan and up sides. (Dough may not come completely to top of pan.) Sprinkle dough evenly with crushed cereal. Arrange apples evenly over cereal. Sprinkle with 3/4 cup sugar and crystallized ginger; drizzle with lemon juice. Roll out remaining dough ball to 15x10-inch rectangle. Carefully place over apples; press to edges. Brush top with egg whites; sprinkle with 3 tablespoons sugar. Make small slits in top of dough. 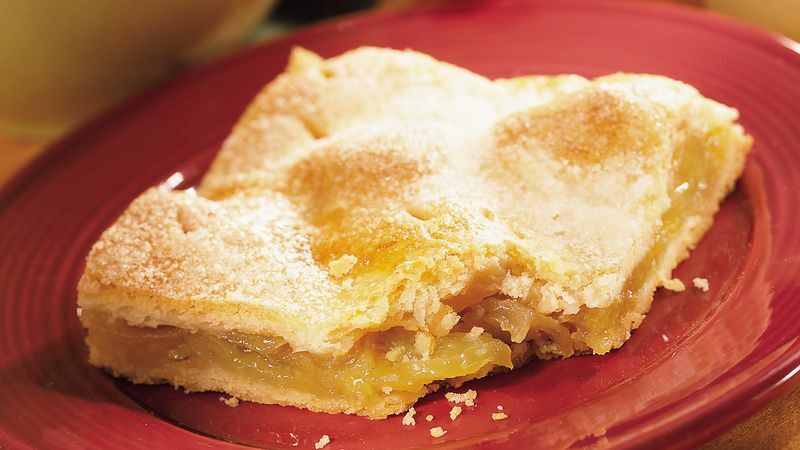 Bake 55 to 65 minutes or until golden brown and apples are tender. Cool 1 hour. Serve warm or cool. This recipe is best served the day it's made. To keep it longer, cover it loosely and store at room temperature for an extra day. Or package the squares in an airtight container and freeze them for up to 3 weeks. Use a floured cloth-covered surface when rolling out the dough.